I don't have a particularly huge collection of sketches from artists, but it's decently-sized (I'd say around 25, give or take), and I think they're all great work, so I figured I'd post them here every so often. I was originally going to show them more or less chronologically, but where's the fun in that? 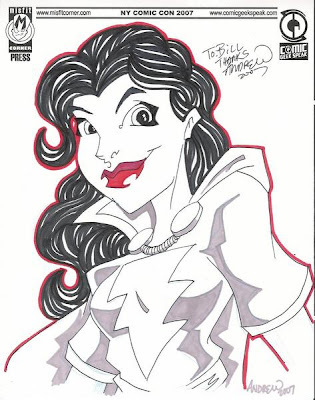 Besides, the artist of the sketch I'm sharing today, Andrew Charipar, is featured in an article posted over on Comic Book Resources today, and as regular readers know, I'm a bandwagon jumper from way back, so here's the Mary Marvel sketch that Drew, well, drew for me at this year's New York Comic Con. Great sketch, and a hell of a nice guy. 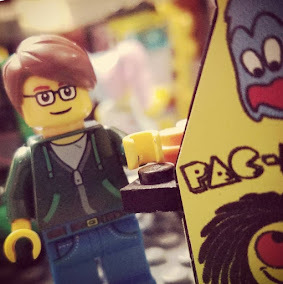 Check out his website (and the CBR article linked above) for info on his upcoming book, Tales from the Cornerstone.